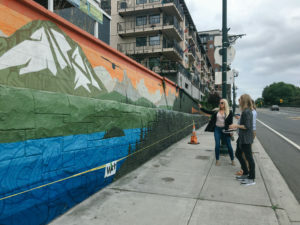 M Agency has some big news: We’ve worked with the sponsorship of none other than Washington’s own Alaska Airlines to set up the painting of an outdoor Tacoma mural that combines city pride, our Pacific Northwest beauty and local history all in one. And we. Are. EXCITED! We are so honored to be chosen by Alaska Airlines to bring this project together, and to have Alaska sponsor the commission of Tacoma artist, Jake “Dkoy” Wagoner, in completing an outdoor mural at Tacoma’s Union Club. The mural shows we are #SouthSoundProud and that, together with Alaska Airlines, we #FlyLikeTheMountainIsOut. The signature South Sound Proud mountain logo will be featured in the mural, bringing the local pride full circle. The coolest part about this is that the Union Club, currently a coworking space for creatives, artists and entrepreneurs (and unique to Tacoma), is strongly committed to the local artist community. Our team saw an opportunity in the Alaska Airlines sponsorship gift to let an artist truly create with no limitations. They are so excited to partner with Alaska Airlines in a way that aligns with their commitment to creative, artistic work, and that also connects back to Alaska, as many of the airline’s employees not only call Tacoma home, but love the Union Club as a space for working remotely. RSVP on M Agency’s Facebook page to join us in the celebration of Tacoma beauty, collaboration, and art. We can’t wait to see you there!